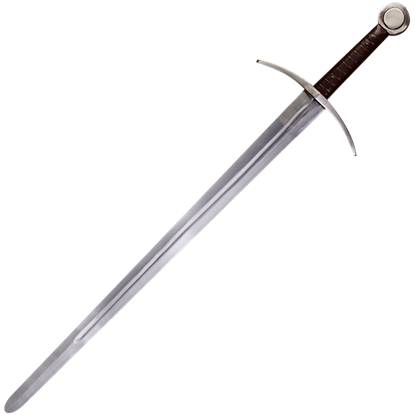 The Knight sword also call the knightly sword was used in from the 12th through the 14th century. 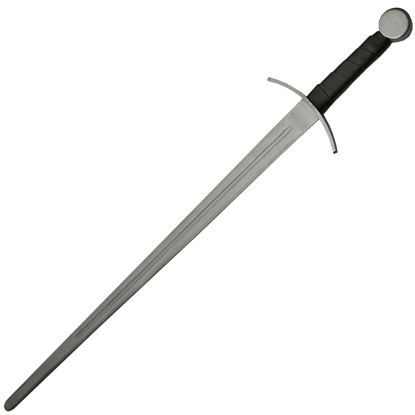 The knight sword has simple straight cross guard and round disc style pommel. A wide fuller blade made it a very fast and maneuverable sword making it awesome cutting power while increasing thrusting ability. 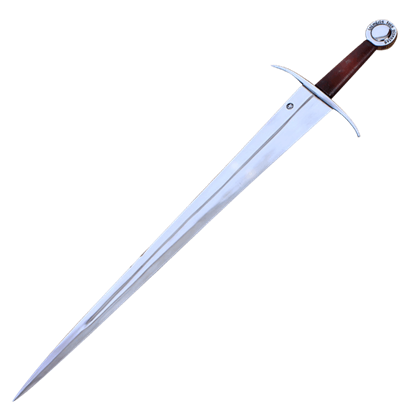 The knightly sword retained enough lightness that it could be swung easily in one hand from horseback, but allowed the warrior to use the blade in two hands while on foot during hand to hand combat. This feature made the blade very easy to move quickly and very powerfully with relatively little effort. These new features of the knight sword made it an effective weapon against mail armour in the 13th century making it the most popular sword in battles. The knight sword is depicted in period artwork more than any sword at that time. 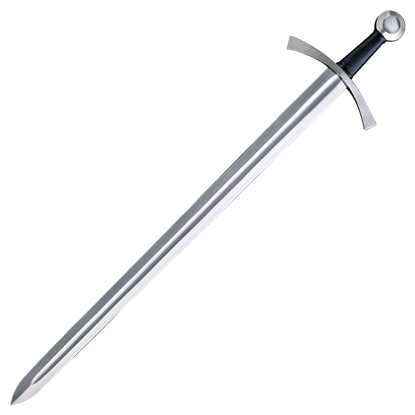 Many sword enthusiast have the knight sword as part of their medieval collection from the Middle Ages. Our Knight swords can be used for display or for battle re-enactments, each reproduction is created to the specifications of the original. The dimensions and weight are accurate on every piece so you get a medieval weapon that is actually balanced and fun to hold instead of just pretty to look at. Medieval times were sometimes brutal, sometimes romantic, but always a source of intrigue. We invite you to share in the experience of an era past with our collection of Knight swords. All our Knight Swords are expertly hand-crafted and authentic replicas! You can display them in your office, home or for Medieval Reenactments. Bold, broad, and powerful looking, the design of this 14th Century Medieval Sword with Scabbard and Belt was in response to plate and mail armour of the age, and its design does not leave a warrior wanting for power or versatility. The long and wide fuller on this blade lightens the overall sword and makes it possible to deliver fast and shearing cuts capable of cutting through the mail and padding that were worn during the period. This Cruciform Knights Sword is patterned the Marshall Sword, which is a part of the William Wallace Collection, and is also named after one of the finest knight found in the pages of English History, Sir William Marshall. The day comes early, and there is much to do. You awaken before the master and quietly head outdoors. With the Curved Guard Medieval Sword in hand, the squire trains alone, unlocking the skills necessary to become a true knight. 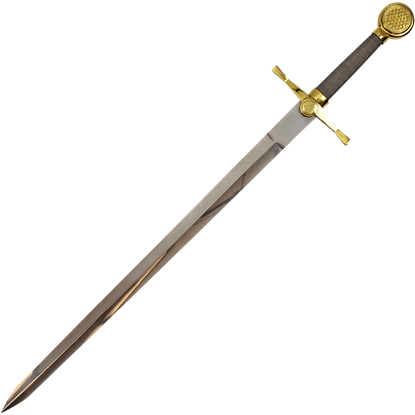 The Damascus and Brass Medieval Knight Sword is a remarkable weapon for any warrior. 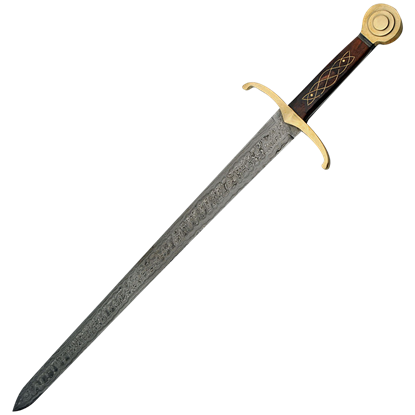 Its beautiful damascus steel blade is matched with an antiqued brass hilt and pommel, as well as a brass ladder pattern on its dark wood grip. Among the many forms of art in the castle of any king, there is usually a sword or two mounted on a wall. 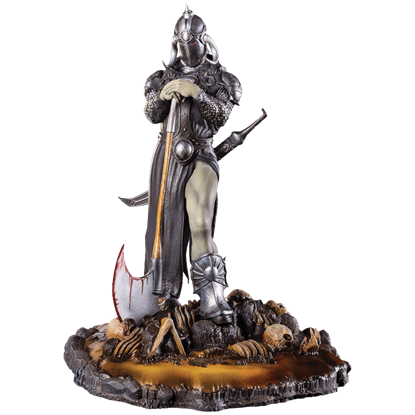 The Golden Knights Sword and Plaque is a knightly sword decoration for you to display on the walls of your own castle!